Early summer marks the beginning of the California grape season. These bite-size treats are the perfect snack – crisp, sweet and only 90 calories per 3/4 cup serving. Grapes are also very juicy, making them a welcome source of hydration as outdoor activities and temperatures increase. Always ripe and ready-to-eat, convenient (no peeling, no seeds), and packable for a picnic or day camp, grapes are really today’s super snack. And there’s more good news: grapes of all colors are a delicious source of antioxidants and other polyphenols, and research suggests that grapes support heart health and may help defend against a variety of age-related and other diseases. Selecting grapes is a breeze, since all grapes are fully ripe when they arrive at the supermarket. Simply look for plump grapes with pliable green stems. Once home, keep your grapes unwashed and refrigerated in a plastic bag until ready to use, then rinse with cold water and serve. While fresh grapes are most often enjoyed as a snack, more and more people have discovered the versatility of grapes as an ingredient. Why? Fresh grapes from California add color, crunch and a light touch of sweetness to snacks and meals. Toss them into yogurt, or nearly any kind of salad: fruit, green, grain, chicken or tuna. Create grape and cheese skewers for an easy appetizer. For a cool summer treat, freeze your grapes: just rinse them, pat them dry, and place them in the freezer for two hours. The result is like sweet bursts of sorbet. Here are a couple more tasty snacks for kids and adults. These wholesome and easy-breezy treats show off grapes’ natural pairing potential with all things dairy. Makes eight standard size frozen treats. Puree the grapes in a food processor or blender (you’ll have about 2 cups). Transfer to a medium-size pot and bring to a boil. Boil the grapes, stirring occasionally, until the mixture has thickened and reduced to about 1 1/2 cups, about 10 minutes. Transfer to a bowl, stir in the sugar and honey and let cool to room temperature. 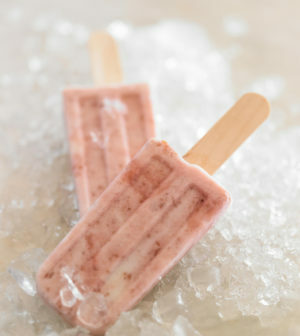 Fold in the yogurt just until nicely swirled, then spoon into frozen treat molds. Cover with foil, insert sticks and freeze for 4 to 6 hours or until set. Nutritional analysis per serving: calories 127; protein 4.2 g; carbohydrate 27 g; fat 1 g; 7 percent calories from fat; cholesterol 2 mg; sodium 16 mg; fiber .5 g.
Break each graham cracker into its four small rectangles. 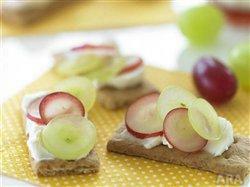 Spread 1 teaspoon cream cheese on each cracker and top with sliced grapes. Serve immediately. fat 1 g; 35 percent calories from fat; cholesterol 3 mg; sodium 40 mg; fiber .1 g.
For more grape snack and recipe ideas, visit www.grapesfromcalifornia.com or Facebook at www.facebook.com/GrapesFromCalifornia.